Less than 2.0: Micro: Micro earthquakes, not felt. About 8,000 per day. 2.0-2.9: Very minor: Generally not felt, but recorded. About 1,000 per day. 3.0-3.9: Minor: Often felt, but rarely causes damage. 49,000 per year (est.). 5.0-5.9: Moderate: Can cause major damage to poorly constructed buildings over small regions. At most slight damage to well-designed buildings, 800 per year. 6.0-6.9: Strong: Can be destructive in areas up to about 100 miles across in populated areas. 120 per year. 7.0-7.9: Major: Can cause serious damage over larger areas. 18 per year. 8.0-8.9: Great: Can cause serious damage in areas several hundred miles across. 1 per year. 9.0 or greater: Rare, Very Great: Devastating in areas several thousand miles across. 1 per 20 years. 12.0: Would be strong enough to split the earth in half. Scientists say tremblors along San Andreas Fault happening more often previously thought. “Earthquakes strike along California’s San Andreas Fault more often than scientists previously thought, a new study suggests. Researchers at the University of California, Irvine and Arizona State charted tremblors that occurred there stretching back 700 years. They found that large ruptures have occurred on the Carrizo Plain portion of the San Andreas Fault — about 100 miles northwest of Los Angeles — as often as every 45 to 144 years. But the last big quake was in 1857, more than 150 years ago. down Interstate 55 to end up in Marked Tree, Arkansas. The massive zone crosses five state lines and cuts across the Mississippi River in three places and the Ohio River in two. 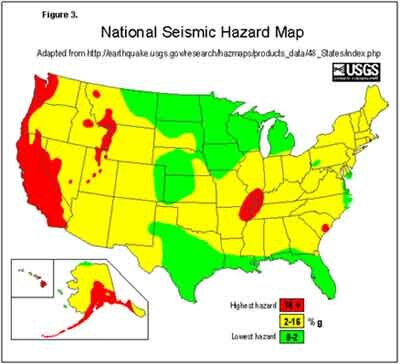 It’s true that the greatest risk of earthquakes in the United States is definitely along the West Coast but, although the tremors may not be as frequent, when they do occur along the New Madrid Fault Line, the damage covers more than 20 times the area. Researchers predict that these types of events occur only once every 500-600 years, which means they don’t expect another for 100 years or more. However, experts including emergency planners, engineers and seismologists have given the event a 3 percent chance of occurring by the year 2040. There’s a 7 percent to 10 percent chance of a magnitude 7.5-8.0 earthquake occurring in this region. There’s a 25 percent to 40 percent chance of a magnitude 6.0 or larger earthquake occurring. the potential to cause great damage. If an Earthquake Hits the Midwest … Are They Prepared? will cause to their emergency facilities, which could cripple response efforts. Some communities haven’t held earthquake drills in more than a decade. “There are lots of other earthquakes that may happen first, but they won’t be as big,” said marine geologist Chris Goldfinger of Oregon State University in Corvallis. interruption in vulnerable locations throughout southwestern British Columbia, Washington, Oregon, and northwestern California. The broad geographic distribution of damaging impacts will generate special challenges and severely stress the response and recovery resources of the three Pacific states and British Columbia. 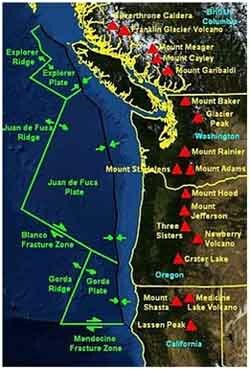 Recent findings concluded the Cascadia subduction zone is more hazardous than previously suggested. years has revealed many magnitude 8 earthquakes on the southern portion of the fault in the intervening years, bringing the average down to 270 years. earthquake. In 1700 the subduction zone spawned an earthquake of roughly the same size as the Sendai event, unleashing a tsunami that may have reached 100 feet high (30 meters). “Portland has a lot of unreinforced masonry buildings that are likely to collapse in a major quake”, Goldfinger said. Blanpied, associate director of the US Geological Survey’s Earthquake Hazards Program, “is that they sit quietly– until they create a giant quake.” And by giant, he means a monster. The Sendai event contained more than 30 times the energy of the San Francisco Earthquake of 1906.
fault could let go again at any moment. tsunami would affect buildings, transportation, utilities, and emergency services. The report, entitled, Cascadia subduction zone earthquakes: A magnitude 9.0 earthquake scenario, painted a picture so grim that it read like a horror story. It was pretty hard to believe—until the Sendai quake brought all its horror vividly to life. It can happen. that have been made. Japan is by far most earthquake-savvy country on the planet. It lavishes millions on research, its building codes are tough, and its people are psychologically ready. Yet despite Japan’s preparations the 9.0 earthquake wreaked havoc on a scale not seen since World War II. Americans, on the other hand, spend little time thinking about earthquakes, and even less money. We’re just starting to explore technologies that the Japanese have been implementing for decades. One step toward protecting the public, for instance, would be to establish an Earthquake Early Warning (EEW) system. The idea is to detect tremors as a fault begins to slip, and then transmit an alarm signal to population centers on the periphery of the quake zone. Since motion of the quake travels at the speed of sound, and the signal can travel near the speed of light, an efficient system could provide a minute or two of warning—enough time to stop elevators and let passengers off, or for a teacher to shepherd her students under their desks. The Cascade Volcanic Arc is a continental volcanic arc that extends from northern California to the coastal mountains of British Columbia, a distance of well over 700 mi (1,100 km). The arc consists of a series of stratovolcanoes. Subduction-zone stratovolcanoes, like Mount St. Helen’s and Mount Pinatubo, typically erupt with explosive force: the magma is too stiff to allow easy escape of volcanic gases. As a consequence the tremendous internal pressures of the trapped volcanic gases remain in the pasty magma. Following the breaching of the magma chamber, the magma degasses explosively. Such an explosive process can be likened to shaking a bottle of carbonated water vigorously, and then quickly removing the cap. The shaking action nucleates the dissolution of CO2 from the liquid as bubbles, increasing the internal volume. The gases and water gush out with speed and force. great subduction-zone earthquakes along the arc. Because the population of the Pacific Northwest is rapidly increasing, the Cascade volcanoes are some of the most dangerous, due to their past eruptive history, potential eruptions and because they are underlain by weak, hydrothermally altered volcanic rocks that are susceptible to failure. Many large, long-runout landslides originating on Cascade volcanoes have inundated valleys tens of kilometers from their sources, and some of the inundated areas now support large populations. Note: The highest tsunami on record was caused by a landslide in Lituya Bay in Alaska in 1958. The landslide itself was triggered by an earthquake, but the tsunami was caused by the earth that slid off a mountain and fell into the bay.” The resulting wave of displaced water was 1720 feet high (1/3 mile)- depending on how you measured it.